This week has seen some exciting news for Japanese music crossovers with the Western world. Today, Lady Gaga announced Hatsune Miku will be opening up some of her tour dates…great, cool, neat. 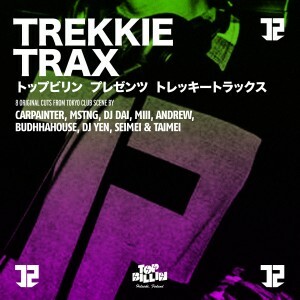 But even if it isn’t headline-worthy, the news that Japanese electronic label Trekkie Trax teamed up with Finnish label/promoters Top Billin is pretty neat too. The European outfit released a compilation featuring new tracks from some of Japan’s finest young producers. It opens with a luxurious house groover courtesy of DJ Dai before zooming off into even more exciting directions. It ranges from Seimei & Taimei’s Mega Man gone festival “Tequila Lime” to (what I think is) the Ali-G-sampling number by Buddahouse. Miii’s contribution has been floating around for a while, though it remains one of his strongest productions to date. For more hyperactive, Jay-Z sampling blurriness, turn towards DJ Yen’s blood-rushing “Release” or the lithe “Frozen Sky” by Carpainter. Get it here, or listen below.